It may not seem like it, but Christmas is one of my most favourite times of the year. To be fair the last few years I have been slack with the Christmas vibes, hardly any presents were bought, no tree put up, very few Christmas parties and just a general slackness with my Christmassy spirit. Anyhow, let me get back to the subject of this post. Living in South Africa we have Christmas in our summer season and so miss out on something absolutely fabulous! That’s right kids … Christmas Jumpers! If you don’t know what they are … watch the Bridget Jones Diary and fast forward to the Christmas lunch when everyone is wearing a Christmas Jumper! Brilliant (actually watch the whole movie … it’s one of my fav’s). The poor Christmas Jumper has got a bad rep … I however am no slave to fashion and absolutely LOVE them. But being in SA our climate doesn’t warrant the shops stocking them for the festive season – bleak! Late 2012 early 2013 we had family friends down from the UK and one night at dinner the subject of Christmas Jumpers came up. I gushed a fair amount about how much I LOVED them and that I would absolutely be filled with glee if I owned one. Michaela said that she’d send me one. I’d kind of forgotten about it (haha jokes of course I hadn’t!) and when my mom phoned to say that Simon and Michaela had sent me a parcel and it was a “prayer shawl” (family joke) my spirits were lifted and I promptly told her to rip it open and tell me what it was! 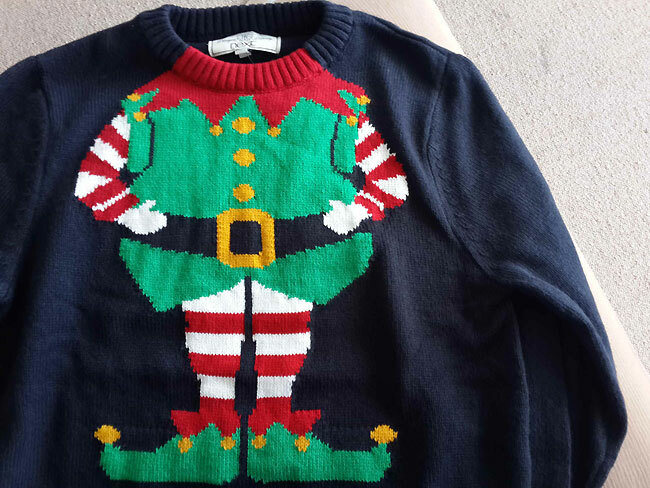 This entry was posted in Luv and tagged christmas, christmas jumper, presents, presents from friends. I love that you’re so happy with this jumper. It is funny!